Wonder what is it? No, nothing. I’m just tired of work. So I picked mine: Green Tea Frappuccino. Actually, what he said is Java Chip, one of the available flavor. So it simply means all stuff that stucked into my mind is work, work nothing but work. It is quite weird in our company. 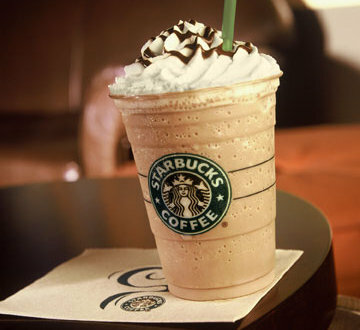 When you’re always late, after 2 weeks, you will be treated with your favorite starbucks coffee or tea or whatever. Actually, the money comes from late fines. For the first 10 minutes, we are charged for some amount. Then every other 10 minutes, it adds another charge for the late fines. Me, being late everyday, would not take so long to reach 300 to 400 pesos in two weeks. If my officemate also gets late, within two weeks, it can reach up to 700 pesos which is just enough to buy us 5 starbucks stuff. I promise, I will not be late again. No, its within my blood… Lol!